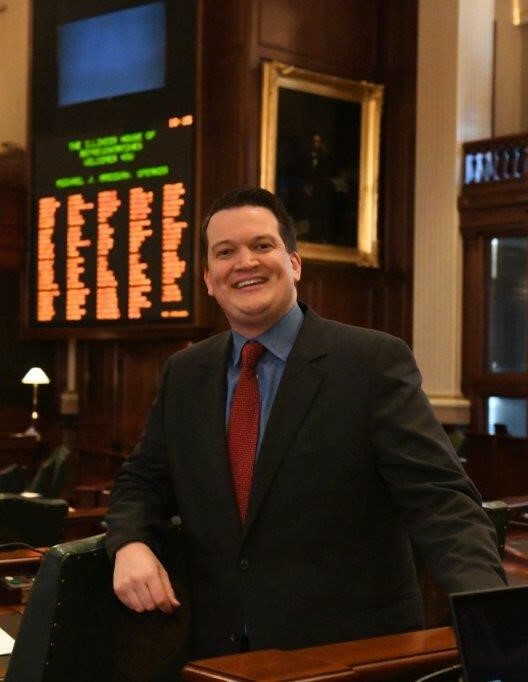 State Representative Andrew Chesney was sworn in to his first full term in the Illinois House of Representatives on Wednesday during the inauguration of the 101st General Assembly held at the University of Illinois-Springfield’s Sangamon Auditorium. Among family and friends joining Chesney in Springfield for the Inaugural Ceremony were local elected officials, including Freeport Mayor Jodi Miller and Stephenson County Board Chairman Bill Hadley. Prior to his service in the Illinois House, Chesney was an elected member of the Freeport City Council, where he built a reputation as a strong advocate for more funding for public infrastructure, blight reduction, and law enforcement. His fiscally conservative record as well as a reputation as a taxpayer watchdog was well earned in local government. He was active in pushing for streamlining and improving city services and changing city policies that promote healthy economic and community development and property improvements.